I loved this sketch, it seems I'm always looking for multiple photo sketches and they are harder to find. This one is from Grand Diva's Creative Corner. Tracy love your layout! Love your interpretation of the sketch including that awesome circle with journaling and the additional photo tucked into the border at the bottom! Thank you so much for linking up this month at GCC! What a fabulous page!! I am loving this! 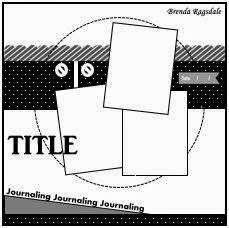 The circle of journaling looks fantastic!